The sounds of tight harmonies and choral music filled Burns Chapel as the Midwestern Singers performed their spring showcase “Spring Flowers.” Led by Dale Heidebrecht, assistant professor of music, the Midwestern Singers sang pieces from nearly all periods in music history. 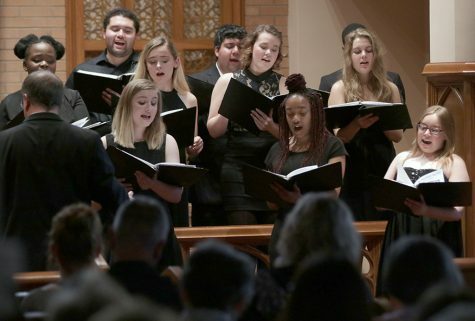 The concert began with the traditional Texan classic “The Yellow Rose of Texas” and quickly moved into an Italian madrigal. Heidebrecht explained musical concepts like text painting and how these techniques would be used in the pieces being performed. The singers sang pieces that were a capella, often led by only a single note from the piano. Later in the concert, the singers moved to more modern pieces such as “Can’t Buy Me Love” by John Lennon and Paul McCartney, as well as Cole Porter’s “I’ve Got You Under My Skin.” These pieces included light accompaniment from piano and percussion, but kept the focus on the harmonies of the choir. One of the audience’s favorite pieces was “Contrapunto bestiale alla mente,” a piece by Adriano Banchieri. The piece required the singers to don animal costumes representing cats, dogs, cuckoos and owls and sing the song as their respective animals. The chapel was full of laughter as the singers meowed and barked their parts in this traditional Italian madrigal. Caleb Crawley, marketing freshman, added that his favorite part of the performance was the costumes. “My favorite part of the concert was when they used the costumes and animal noises in one of their pieces,” Crawley said. The relatively small chapel was filled with an audience ranging in all ages. Students, parents, community members and faculty were all in attendance. Many students came for their music appreciation course. Other students went to support their friends who were in the choir. Even though many in attendance hadn’t attended one of the Midwestern Signers’ concerts before, they said that they enjoyed it and would definitely come back.